Plymouth moved back into League One’s top six with a comprehensive win over mid-table Southend thanks to two goals apiece from Ruben Lameiras and Graham Carey. Simon Cox missed a golden opportunity to level when Argyle keeper Remi Matthews could only parry Dru Yearwood’s thumping 30-yard drive into his path. Southend would rue that miss as within a minute as Carey fired promotion-chasing Plymouth two goals ahead with an audacious, deflected strike from the right of the box that flew up and over Oxley and in. Carey doubled his tally and extended Argyle’s lead in the when he swept in Oscar Threlkeld’s pinpoint cross from the byline. He missed an opportunity for a hat-trick when substitute Joel Grant won a penalty after John White’s foul, Carey’s rising spot-kick flying off the top of the crossbar. It was left to Lameiras to make it 4-0 late on when he pounced as Oxley failed to hold Grant’s strike. The Pilgrims go to Scunthorpe United on Monday at 3pm. Wigan stepped up their League One title push with victory over Oldham at the DW Stadium. Paul Cook’s men are jostling with Blackburn and Shrewsbury for silverware and automatic promotion, and they barely needed to get out of second gear as goals from Will Grigg, James Vaughan and Nick Powell clinched the points. Oldham, desperately fighting to hold on to their third-tier status, posed a threat while the score remained goalless as Eoin Doyle tested goalkeeper Christian Walton from the edge of the box. But from the moment Grigg opened the scoring five minutes before half-time, when firing home his 19th goal of the season, the result was never in doubt. Grigg made way for Vaughan at the interval, and the substitute doubled Wigan’s lead within four minutes of the restart after an awful mistake in the Oldham defence. Powell made it 3-0 after 66 minutes with a delicious strike from just inside the penalty area to complete a routine win. Relegation-threatened Rochdale ran out winners against promotion-chasing Shrewsbury in a game that ended in controversy at Spotland. Shrewsbury were awarded a penalty in time added on with the chance to equalise but referee Richard Clark changed his mind and awarded a corner, from which Dale’s Ian Henderson broke downfield to score a third. 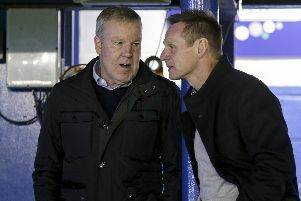 Shrewsbury are now third, a point behind Blackburn, who won on Thursday night, and two behind leaders Wigan Athletic, while Dale edge to within four points of safety. Oxford United drew 1-1 with Scunthorpe while Doncaster won 2-1 at Blackpool. Bristol Rovers beat Bury 2-1 while Charlton earned a 4-0 away victory at Northampton. Tariqe Fosu scored twice as Lee Bowyer made it two wins from two games in caretaker charge of the Addicks. Charlton are at home to Rotherham on Monday. Fleetwood took a huge step towards survival in League One as Jack Sowerby’s goal secured a vital victory on a saturated pitch at AFC Wimbledon. The Cod Army’s third straight win took them eight points above the relegation zone with seven games left, while the Dons – still only two clear – remained in trouble. Jack Marriott scored a last-gasp equaliser in a 1-1 draw at Rotherham to keep Peterborough in the League One play-off mix. Peterborough host Northampton on Monday.